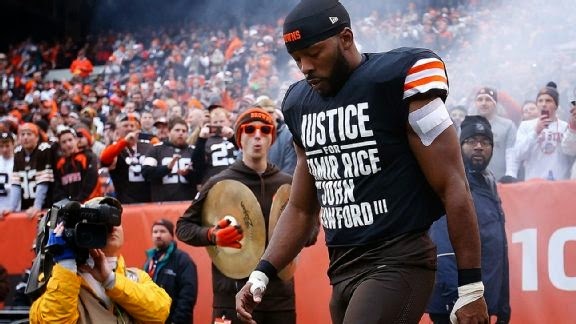 Andrew Hawkins was moved to tears in a new video as he explains why he wore the “Justice For Tamir Rice and John Crawford” t-shirt recently - activism that had prompted the head of the Cleveland Police Union to demand an apology from the NFL player. Tamir Rice was a 12-year-old shot dead by a Cleveland police officer after Rice was discovered in a park waving around what was assumed by police to be a real gun. John Crawford is making the news due to a newly released video that shows police threatening and accusing Crawford’s girlfriend of being high after police shot and killed John Crawford at a Wal-Mart store in Beavercreek, Ohio, reports Yahoo! News.